The best part about creating blog brands is getting the chance to work with local creative ladies. 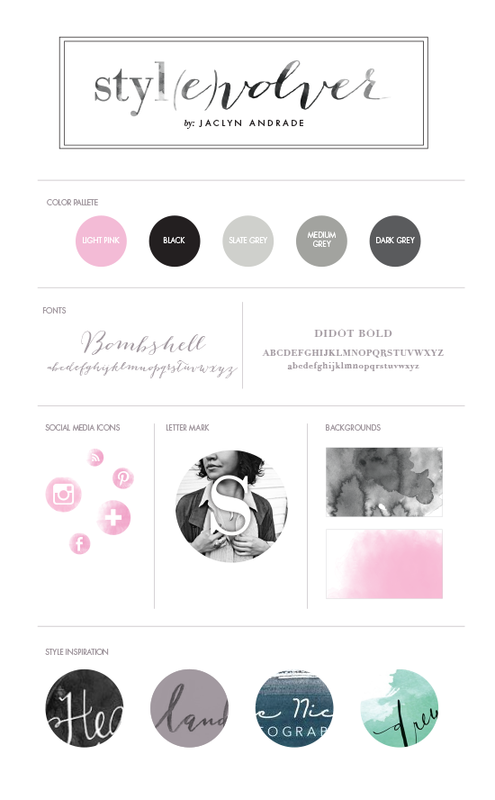 I met Jaclyn of Stylevolver a few months back and we collaborated on creating a new brand for her site. She wanted to do all black and white muted water colors with splashes of “Beyonce” pink hehe. Which worked out amazingly because you’re seeing these colors all over for late winter and early spring! She must be a mind reader or a really great trend setter! We will be doing a full site re-design in the near future and I’ll tell ya we’ve got some pretty rad tricks up our sleeves! I aim to be friend’s with all my clients and feel we accomplished that during this process. I wish all my clients lived closer so I could get to know you in person. But thanks to the world of blogging we still get the chance to connect despite the miles apart. Are you or someone you know in need or a new brand for their blog? If so, I’d love to help create an online space that you love. Hit me up! so cool! you are amazingly talented! I’d like to think I’m more of a trend setter!? Lol jk that’s so much for this cool post Haley !! I’m excited for what’s to come! How lovely! The watercolor effect is wonderful. Oh this is just dreamy. Great work clever thing.